optimizes organization to accommodate the most modern supplies being used by emergency professionals today. The bag features DuPont Cordura construction, YKK zippers, and dual-density, Plastizoted structural foam for the highest quality and long life. 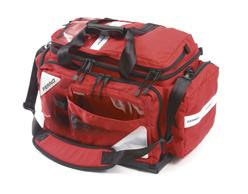 The bag also features a low-profile back to keep the kit close to attendant and a tuck-away backpack harness system. · DuPont Cordura construction and dual-density, Plastizoted structural foam offer the highest quality and longer life.